So how is 2019 going for you so far? Christmas and New Year are already beginning to feel like a distant memory! And if you made New Year resolutions, are you managing to stick to them? 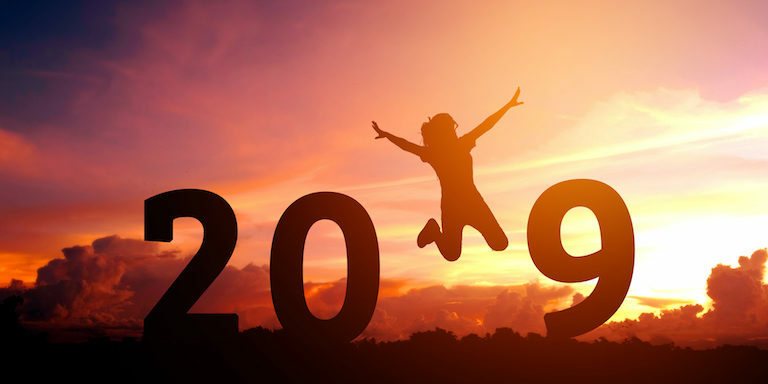 According to research by the market research organisation YouGov, only around one in five (22%) people in the UK were planning to make a New Year’s resolution for 2019. Interestingly, this figure was higher amongst younger people (37% of 18 to 24 year olds). But most people in the UK had no intention of making a resolution. Previous research by Yougov had found that the ten areas below were the most common areas for New Year resolutions. But only around only a quarter of those people who do make resolutions actually manage to keep them. So if you either did not make any New Year resolutions, or did make them but have not stuck to them, you are not alone. But that doesn’t mean that you should not bother to have any hopes or dreams for 2019. Far from it! New Year is an obvious time to decide to make changes in your life, but it is not the only one. There is nothing to stop you making such changes at any time of the year. So if there is something that you would actually like to change in 2019 – but you have missed the New Year resolution opportunity – it doesn’t matter. Every day is a new day, and you can make changes at any time you choose. In fact, starting to make changes away from all the hype of New Year might well be more effective. In the hazy lazy days of holiday time it can be all too easy to be unrealistic about what you can achieve. In those circumstances it seems perfectly possible that you will somehow return to your everyday life as a completely different person and be able to achieve perfection in everything you do. This is probably why so many people do not stick to their resolutions: once you get back into the busyness and reality of day to day life all your brilliant ideas just seem too overwhelming and it is much easier to give up. But now that you are back in the real world again, why not focus on just one thing that you are going to change in 2019? It may be something from the above list, or something else altogether, but if you just focus on one thing then there is a much greater chance that you will achieve it. When you have decided what you want to focus on, you need to give yourself every opportunity to establish it as a habit in your life. It can take around 2 months to develop a habit to the extent where it becomes ingrained in your everyday life. So it is important to break your goal into specific actions and make sure that you do these regularly until they become a habit. For example if you want to do more exercise or improve your fitness then have specific actions that you will take to do this. If you are too vague it won’t happen. So decide on a type of exercise that you will enjoy and build it into your weekly routine. Be careful not to be too ambitious at first, otherwise you could be setting yourself up to fail. But if you plan two or three times a week when you will do some exercise of your choice, and stick to it no matter what, it will then become part of your routine. You may even want to increase it at a later stage – but better to start small and build up than try to do too much too soon. Similarly if you want to start saving money in 2019 then start small. Open a new bank account and pay a very small regular amount into that each month, no matter what else happens. Then each month find other ways to gradually supplement that. For example you could start by cutting out one treat each week – for example a bottle of wine, packet of cigarettes, a takeaway, on demand movie or a magazine. Put the money you would have spent on that straight into your savings account. Before long your savings will start to mount up, without you having to make too many adjustments or sacrifices along the way. So even if you missed out on New Year resolutions at the beginning of January, it is never too late to start making changes. It is always possible to become the New You!